The anger on the progressive left side of American politics over the appointment of Judge Brett Kavanaugh to the Supreme Court has clearly not yet subsided. A Minnesota teacher’s assistant was put on administrative leave today after she had posted a death threat to the judge on social media over the weekend. Related coverage: <a href="https://thegoldwater.com/news/38699-Kavanaugh-Hundreds-Arrested-At-Supreme-Court-Protests-Video#38705"> Kavanaugh - Hundreds Arrested At Supreme Court Protests (Video)</a>. Calls to a phone number listed for Miss Ness were not immediately returned. 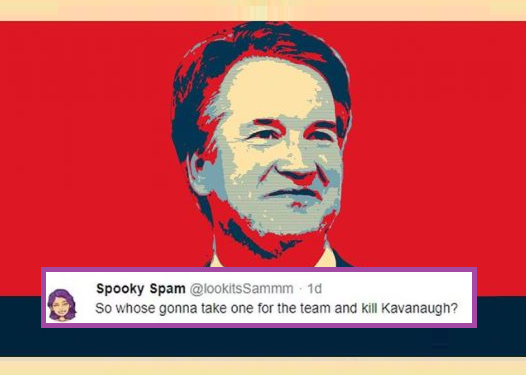 The tweet was published just hours after the White House nominee, Judge Brett Kavanaugh was sworn in after a bitter weekslong fight between Democrats and Republicans over his nomination. The hearings were mired by allegations of sexual harassment by Dr Ford and made for a serious political debate on all sides of US media.